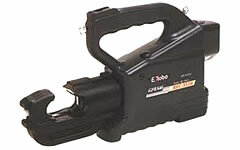 REC-3510 Battery Operated Tools: Izumi Products. The REC-3510 is the third generation of this model ROBO tool and has the largest jaw opening of all our battery operated 12 ton compression tools. The opening is 42 mm which will accept mid-span copper and aluminium sleeves and cables up to 750 KCM. This tool accepts all u type dies on the market. 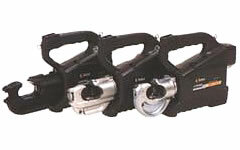 Portability and handling are made easier because the REC-3510 system is self contained and compact. It features a new, larger handle opening with a rocker type switch located on the top of the handle for one fingered trigger operation. The number of crimps per charge for maximum conductor : 37 crimps/BP-70E. This tool is designed to accommodate shell type dies for applying compression fittings to copper, aluminium and ACSR conductors.